Palm Island Resort, on Florida’s Gulf Coast near Boca Grande and Englewood, is one the most peaceful, tranquil and relaxing resorts we have ever visited. Accessible only by water taxi, boat or ferry, Palm Island Resort is never crowded, never loud and never touristy. It is a family-friendly resort where they emphasize quality, family and nature. As we drove the grounds, we rarely saw groups of people even though the resort was sold out. We walked the beautiful beach for a mile and encountered less then a half-a-dozen other people. We spoke with Palm Island Resort’s Vice President and General Manager Rick Brunette and Guest Service Manager Susanne McCarthy during our two night, three day stay. How would you describe Palm Island Resort? Susanne: Palm Island Resort is seven miles long and has 2.5 miles of private beach. It is very spaced out so guests don’t feel crowded. Each village has a pool, hot tub, changing rooms, and grills. We are very family oriented. Rick: We want to sustain tranquility and quality. We understand our niche. The isolated and relaxed atmosphere is who we are. Who visits Palm Island Resort? Rick: The owners here have a passion for the resort. We have more than 270 properties on the island. Over 70 are available to rent. About one-third of our business comes from Florida. We have about 40,000 guests annually. We have about 50 weddings a year and three corporate functions. Our peak season is mid-February to mid-April. We have a 50% return rate for our guests. Guests who return come back again and again. Susanne: Our guests come back for 20 and 30 years. 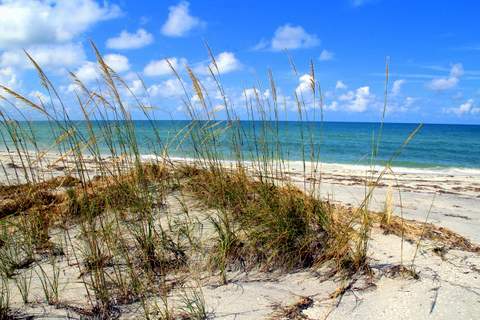 Some say it is Florida’s best kept secret. What can you tell us about the rentals that are available? Susanne: We have a total of 243 homes. 75 are available as rentals. What activities are offered at Palm Island Resort? Rick: We have a lot of added services to offer like kayak rentals, excursions, nature tours. We want people to have options for activities but we don’t want the hustle and bustle of other resorts. We purchased the water taxi. We can do sunset cruises and nature cruises. Nature is important to us. We even donated land to Lemon Bay to protect the wildlife. Hopefully, our kayak tours will help people learn more about nature. Susanne: A naturalist offers kayak tours, nature tours and yoga on the beach. Red Beard the Pirate sings, tells pirate stories and does crafts with kids. Kids who saw Red Beard years ago now bring their kids to see him. Can you tell us about Rum Bay restaurant on the island and Leverocks on the mainland? Rick: Leverocks is a seafood dominant menu and is very bistro-like. Because Rum Bay is our only restaurant on the island, we offer something for everyone. We have everything on our menu from filets to pizza. The bar can get pretty active on sports nights but we also see a lot of friends having conversations. Many friends get together for the first time after being away all season because it is a great place to meet. Susanne: We offer a complimentary water taxi to Leverocks for guests. Staying at Palm Island Resort is a truly peaceful, tranquil and relaxing experience. We enjoyed every moment. Palm Island Resort is located at 7092 Placida Road, Cape Haze, Florida 33946. Their phone number is 1-800-824-5412.